A community’s general plan can go a long way toward creating healthier neighborhoods – increasing opportunities to buy fresh foods, making it easier to walk and bike throughout the day, reducing crime and pollution, and more. The process of getting health-promoting policies into a general plan can seem daunting. But city planners, health department staff, local advocates, and others all have a role to play – and this planning process offers a critical opportunity to shape local development patterns for decades into the future. 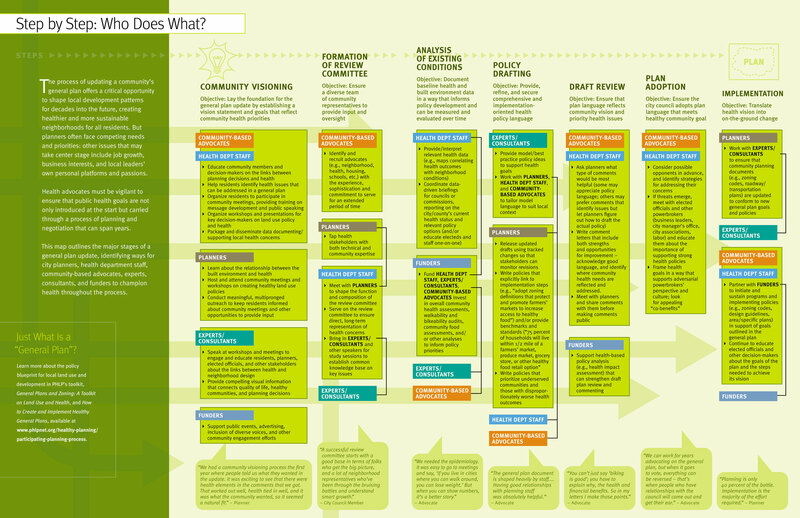 Funded by The Health Trust and informed by an evaluation of public health advocacy in three Bay Area communities, this roadmap highlights roles and strategies for key players to consider along the way. You can download our four-page guide or just the step-by-step infographic below.